After the terrorist attacks on 9/11, Sanders voted in favor of use of force. camera (University of Chicago Photographic Archive/Special Collections Research Center/University of Chicago Library.) 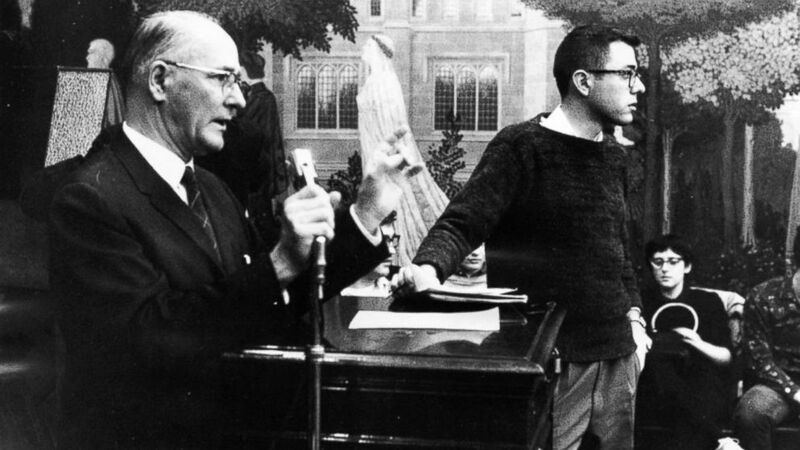 Bernie Sanders, right, member of the steering committee, stands next to George Beadle, University of Chicago president, who is speaking at a CORE meeting on housing sit-ins. "As a college student in the 1960s he was a pacifist," Michael Briggs, campaign spokesman added in an email. "[He] isn't now." Last week, the Des Moines Register ran a column from a Hillary Clinton supporter and Vietnam veteran, titled, "How can Sanders be commander in chief?" "My question as a Vietnam veteran is: How on earth could a person claiming to be a conscientious objector become the commander in chief of the most powerful military in the world?" questioned the column author Steve Wikert. According to a profile from the Vermont Senator's hometown newspaper, the Burlington Free Press, his conscientious objector status application was eventually rejected, but by then Sanders was too old to be drafted. Sanders's political and anti-war activism in the 1960s and '70s has been well-documented. While at the University of Chicago, he was a member of several progressive peace organizations, including the Student Nonviolent Coordinating Committee and the Student Peace Union. As a congressman and later senator, Sanders has rarely voted to authorize the use of force. In 1991, he stood in opposition to the first Gulf War, voting against military involvement in the country even after Saddam Hussein invaded Kuwait. "I think we could've gotten Saddam Hussein out of Kuwait in a way that did not require a war," he told ABC's Martha Raddatz Sunday on "This Week," arguing that with the world in agreement, other options were available, including sanctions. After the terrorist attacks on 9/11, Sanders did vote in favor of a military response in Afghanistan. But Sanders said the use of force, in his opinion, is not only permissible in response to an attack. "I believe that the United States should have the strongest military in the world. We should be working with other countries in coalition. And when people threaten the United States or threaten our allies, or commit genocide, the United States, with other countries, should be prepared to act militarily," he continued. Sanders's campaign website does not include any foreign policy or national security information under its "On the Issues" tab, but the Senator said he would be focusing more on those issues in the future. On the campaign trail, Sanders does talk about his work on the Senate Committee on Veterans' Affairs and what he sees as the long-term, human cost of war. "The cost of war is great, and it is far more than the hundreds of billions of dollars we spend on planes, tanks, missiles and guns," Sanders wrote in an opinion piece in the Boston Globe last summer. "The cost of war is more than 6,800 service members who have died in Iraq and Afghanistan. The cost of war is caring for the spouses and children who have to rebuild their lives after the loss of their loved ones. It's about hundreds of thousands of men and women coming home from war with post-traumatic stress disorder and traumatic brain injury, many of them having difficulty keeping jobs in order to pay their bills. It's about high divorce rates. It's about the terrible tragedy of veterans committing suicide," he wrote.